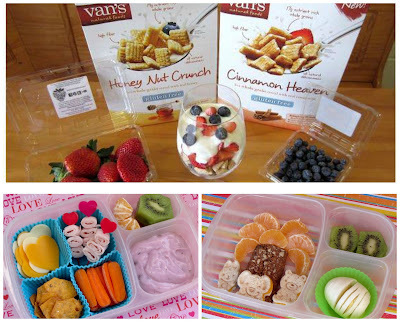 BentoLunch.net - What's for lunch at our house: Van's Giveaway - New Snack Bars, Cereals, & Crackers! Van's Giveaway - New Snack Bars, Cereals, & Crackers! As you might know, I've been lucky enough to be working with Van's Natural Foods for the last few months, contributing on their blog as a writer. One of the perks of that was getting to try out their new gluten-free snack bars, cereals and crackers before they hit the shelves. All were met with F&B approval, which can be somewhat hard to obtain! Three lucky winners will receive two coupons to try the product(s) of their choice. Because of the coupon details, this contest can only be open to winners in the US so the coupons will work. Want to win? Just fill out the Rafflecopter below, commenting on which product you are most excited to try! FTR, my favorite is the Say Cheese crackers! Peanut Butter Chocolate snack bars! That's something that Buc, Samara and Lily would like! Lot's of Everything Crackers! I just love crackers. I would love to try the Honey Nut Crunch. The Lots of Everything crackers sound great! The chocolate chip snack bars sound so good! I LOVE Vans snack bars! We would love to try the chocolate chip snack bars! Thanks for the giveaway! Cinnamon Heaven GF cereal sounds so good! I want to try the chocolate chip snack bars. I think the crackers would be my first choice, but the snack bars are also tempting. We already buy some of the Vans cereals, though not either of the ones mentioned here. Ooh, those look so yummy. I'd love to try the chocolate chip snack bars.. anything really! Cinnamon heaven sounds amazing! Great post! i'm gluten free and always looking for new items! sound yummy! if i had to choose, i'd love to try either the crackers or the snack bars!!! I want to try the snack bars and my kids want to try the French Toast Sticks! Thanks for the giveaway! We can't do the nut items, so I would share that coupon (if I were to win) but would love their new cheese crackers!! Say Cheese crackers, for sure! The Honey Nut Crunch Cereal !